Boasting a spiritual theme but delivering very real winnings, Goddess of Life is a five reel, three row and 20 payline slot with a theoretical return to player percentage of 95.57%. With reels depicting images including each of the four life elements, the slot also boast wild substitutions, scatter wins and a bonus round to add extra winning potential and make gameplay more immersive. Wild substitutions and scatter symbols boost the slot’s winning potential nicely. Those features, together with free spins and a separate bonus game, also help to make Goddess of Life gameplay really immersive and fun. There are only three different line bet options available, meaning that staking choices are limited when compared with most other slots. The value of payouts behind the top jackpot fall away dramatically. The Goddess of Life sound effects get quite annoying, quite quickly and are also a little creepy. 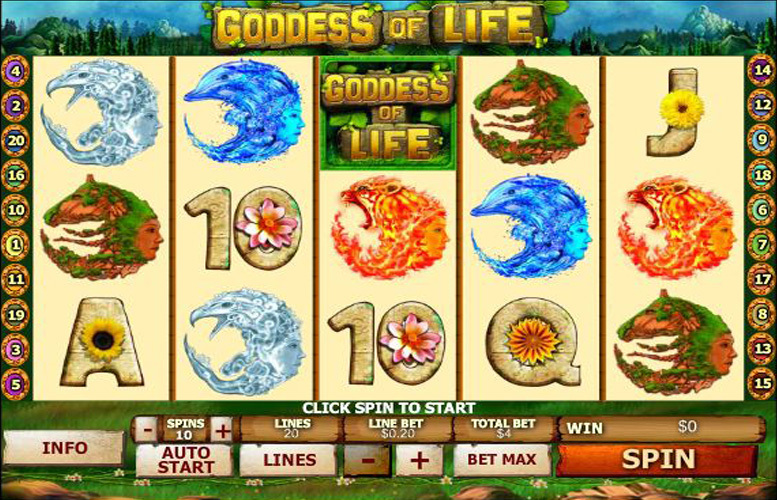 As a five reel slot game, Goddess of Life provides the highest payline jackpots when a combination comprising five identical symbols lines up along one of the game’s active paylines. The most valuable combination of all is one showing off five of the slot’s Goddess of Life wild symbols. Five of those wild symbols aligned along an active payline results in a jackpot worth 10,000 times the player’s chosen line bet. The maximum line bet able to be chosen stands at £5, meaning that the overall top jackpot available through Goddess of Life is £50,000. 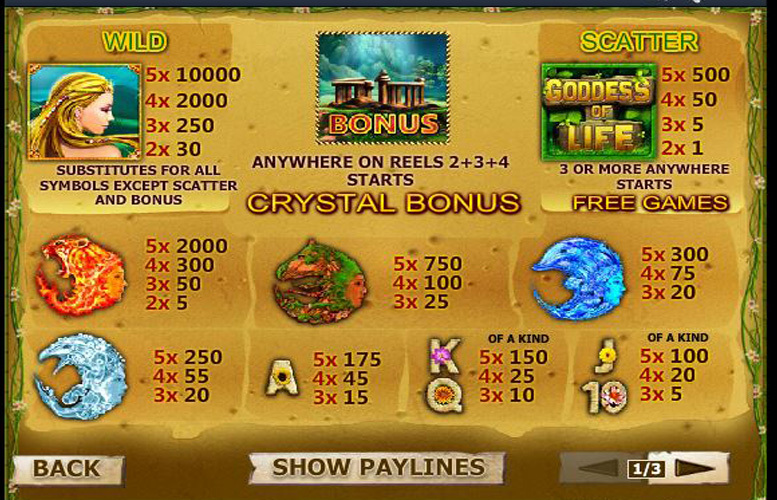 As well as that and other payline jackpots, Goddess of Life also offers a number of other ways to win through its additional game features. Those features include wild substitutions, scatter symbols which trigger both instant wins and free spins, and a bonus round. The Goddess of Life symbol doesn’t just go toward making up the most valuable possible payline combination, it also works as a traditional wild. That means that when the symbol appears on the reels it can stand for any other symbol – apart from the scatters or bonus symbols – in order to produce the best possible payline combination. Scatter symbols included on the Goddess of Life reels serve two different but equally beneficial purposes. First of all, if two or more of the symbols appear after any spin, the player will receive an instant cash prize. If three appear, meanwhile, they will also trigger free spins for which the appearance of any wild will treble the winnings. 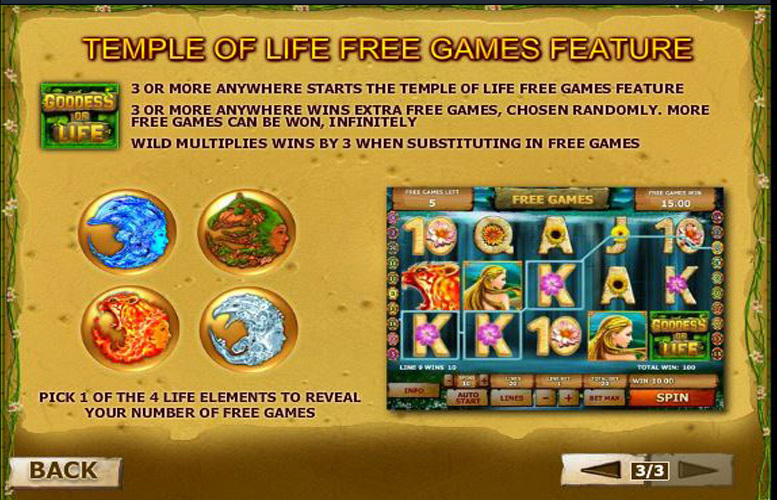 The number of free spins triggered is determined by choosing one of the four life elements when prompted. Goddess of Life’s so-called Crystal Bonus Round is triggered when the game’s ruined temple bonus symbol appears on reels two, three and four. 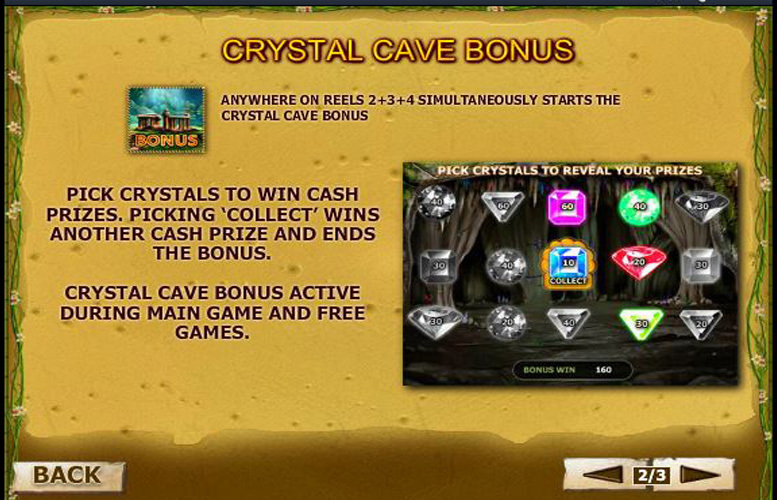 In the bonus game players must choose crystals in order to reveal cash prizes or the word ‘collect’, which will end the game. The Goddess of Life regular symbols keep to the slot’s spiritual theme, with the most valuable of them being those depicting images of the four life elements. Those are the fire, earth, water and air elements, and five symbol combinations of those symbols are the most valuable behind the wild symbol combination. If five of the fire symbols align on an active payline the resulting jackpot is worth 2,000 times the line bet. Five of the earth, water or air symbols, meanwhile, pay out at a rate of 750, 300 and 250 times the bet per line, respectively. Goddess of Life players’ choices when it comes to staking amounts is unfortunately one of the more limited around. Whilst they can choose to activate anywhere between one and 20 paylines per spin, after all, there are actually only three different line bet options provide. Those options stand at 20p, £1 or £5 and mean that the minimum bet per spin possible stands at 20p and the maximum possible is £100. That is quite a limited range and the number of alternatives within the range are also quite few. Set in a spiritual realm of goddesses and life elements, Goddess of Life is a slot with plenty of tangible and more practical benefits to get your teeth into. The slot’s top payline jackpot of £50,000 isn’t the largest you’ll find but certainly compares well with a lot of other similar slot games. What’s more, wild substitutions, scatters, free spins and a bonus round help to boost winning potential further still. Those aforementioned additional features also help to add interest and innovation to gameplay, to prevent the slot from getting repetitive. The one major downside of Goddess of Life, however, comes from the relatively limited selection of staking options provided to players. This game has a rating of 4 / 5 with 268 total reviews by the users.